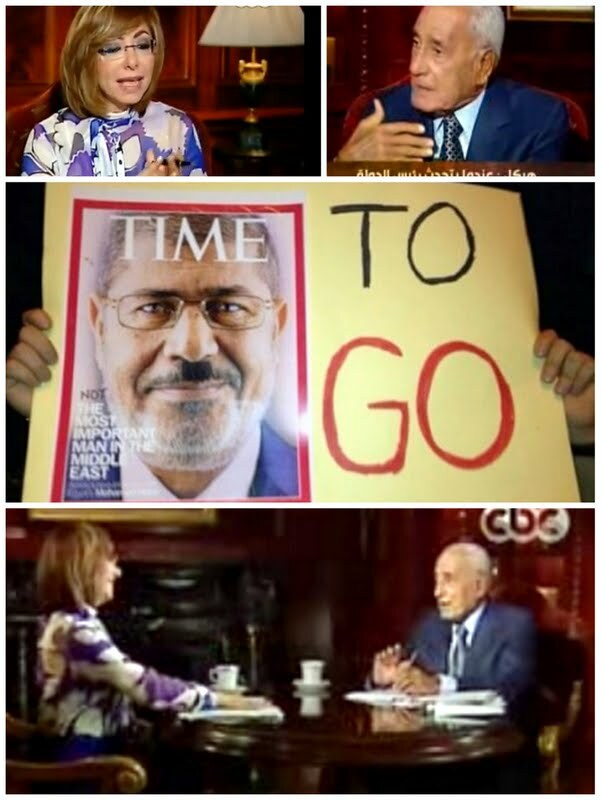 Ms Hadidi interviewing Heikal last night (top and bottom) and a call for Morsi "to go"
The battle lines are drawn for post-June 30 Egypt. The opposition is billing June 30 as President Mohamed Morsi’s last day in office -- “but we don’t have an inkling of what comes next,” says Mohamed Hassanein Heikal. Egypt and the Arab world’s leading journalist and commentator for 50 years was talking last night to CBCEgypt TV anchor Lamis Al Hadidi. Morsi promised when he was inaugurated a year ago to give Egypt a face-lift in just 100 days. One year on, he faces widespread discontent as much of the country is seething with anger and frustration over the perceived failure of the president to tackle any of the country's pressing economic and social woes. The opposition accuses the president and his group, the Muslim Brotherhood, of trying to Islamize the state and of giving the Islamists a monopoly over key public institutions. In return, hundreds of thousands of Islamists rallied for Morsi in Cairo last week, symbolizing Egypt's increasing polarization. They dismissed the anti-Morsi campaign as unconstitutional as the president does have electoral legitimacy. Many locals fear the protests on Sunday will turn into bloody showdown between both camps. Fearing the worst, the Egyptian army has deployed reinforcements of troops and armored vehicles to strategic locations across the country, chiefly the main presidential palace in Cairo. As political rivals lock horns over the "Brotherhood-ization" and "secularization" of the nation, opinion polls point out to the mounting public discontent. A new poll by the Egyptian Center for Public Opinion Research (Baseera) indicated a sharp decline in the president's approval ratings to 32% compared with 78% at the end of the first 100 days of his tenure. Public anger is soaring over expanding power cuts, water cut-offs in some districts and falling living standards. Fuel is in short supply as well. So is patience. For the millions of poor, it is the stagnant economy -- caught in collapsed sources of income like tourism, rising food prices and a growing population dependent on subsidized bread -- that matters. Foreign currency reserves are half of what they were under Hosni Mubarak and the value of the Egyptian pound has fallen by 10% against the U.S. dollar since last year. Almost daily strikes by angry civil servants and factory workers demanding better conditions have also become a fact of life. The president says he has been left with no options but to rely on Muslim Brotherhood members and Islamist allies after the opposition turned down his national reconciliation endeavors. The opposition, in turn, says Morsi's calls for dialogue are never sincere and insist on early elections. With the circle tightening around him, the president gave a televised marathon speech on Wednesday night in a bid to upstage the massive demonstrations planned by the opposition on Sunday. The president was unclear as to what he intends offering or doing. He substantiated Egyptian society’s polarization by choosing to sound like a party leader. You can’t speak as a part leader when addressing an invited audience of state officials. The party is one thing and the state is another. The president we saw on screen (Wednesday night) looked baffled, yet his words resonated with drumbeats of war. His attack on the media was totally misplaced. It showed him fighting the wrong battle at the wrong place and time, the country being already stirred up. Because of its poor political performance in office, the Brotherhood-Islamist partnership has seen its popularity-rating plummet to 30% from 60% in the last parliamentary elections. The reason for this, I think, is the Muslim Brothers’ misplaced arrogance. I saw them when downtrodden first and then arrogant. Some of them now sound more pompous than Queen Victoria. Morsi expressed a compassionate concern for the poor, but failed to give them hope in the future. “Pre-emptive demonstrations” organized by the Muslim Brotherhood and fellow-Islamist in the countdown to June 30 are misguided. Morsi was unclear about what he intends doing and how. I don’t understand, for example, how he can complain about inheriting a debt-ridden economy and then go out and borrow more to settle the national debt. Also a head of state does not publicly criticize Ahmad Shafiq when legal proceedings against the presidential runner-up remain pending. In truth, the Muslim Brothers assumed power and offered nothing. They simply kept leaping in the dark. And the wrong steps they took over the past four weeks risk plunging the country in civil war. The Egyptian army is the people’s -- not the Emir’s – army. It is Egyptian nationalism’s godfather and brainchild. Its latest statement sounded the alarm, saying we are all at risk. The Supreme Guide of the Muslim Brotherhood ought to come forward and address the people in person because what is taking place in Egypt gives the lie to the modern state and to transparency. Governing the country out of sight of the public is impermissible. Whoever holds the strings of power must be called to account by the public.